You should start looking between four-to-six weeks before your expected move-in date (keep in mind August is extremely competitive). Plan on seeing a lot of apartments before you make your final decision: the average hunter sees about 10 in person. Apartment listings have gone digital, so at least you don't have to hit the pavement to find "For Rent" signs like back in the day. Brokers - Consider whether it’s worth shelling out dough for brokers: they have access to unlisted rentals, have the resources to show many apartments quickly, and ultimately can save you a ton of time. Just be sure to be very specific about what you’re looking for and stick to it, as brokers are notorious for conning renters into apartments that are out of their range. That being said, there are a lot of great brokers out there. Solo – If you’re searching alone, be prepared for a lot of tedium and hassle. You’ll likely go through hundreds of listings before finding locations that are both in your range and livable. Be ready for a heavy time commitment but don’t lose your cool. Ask Around – Let your family and friends know you’re in the market for a new pad. If you’re working, some companies help their employees find places with local agents. You never know where an opening might turn up. Check Everything – Once you’ve zeroed in on a potential place, stalk the building and ask the tenants about the landlord, the plumbing, the cost of utilities, whether there’s anybody exceptionally loud in the building, and anything else you feel is important you should know before you sign the lease. Landlord-Tenant Laws – It might be a good idea to brush up on your rights as a tenant before you seal the deal to make sure you don’t get fleeced by a sleazy landlord. Hunting Resources: Knowing How to Look for an Apartment, Apartment Hunting Resources for Top Recent Grad Cities, Surviving the Apartment Rush, and Landlord-Tenant Laws. Once you’ve found the place of your dreams, make sure you set up the utilities by the time you move in so that you’re not stranded without entertainment. Moving is expensive, so check out our survival guide on furnishing your apartment on a budget. 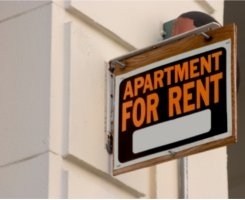 Finally, something oft ignored but hugely important: don’t forget to buy renter’s insurance. It’s cheap and will keep you covered should disaster strike. Pimping Resources: Setting up the Utilities, Furnishing Your Apartment, and Buying Renter's Insurance.